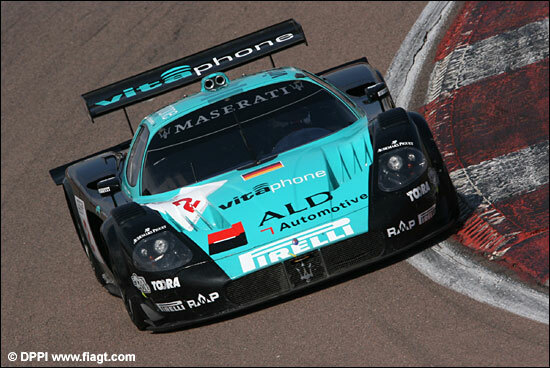 Zakspeed Saleen Fastest – Or Vitaphone Maserati? There are some interesting tables on the MST website (with all the information relating to the Dijon test days this week) – and the best sector times tell a slightly different story to the combined teams posted on dsc earlier today (a slightly cranky dsc today, alas – with apologies if you’ve found the service unavailable at times…). 11 16 GT1 ROCK MEDIA MOTORS Pagani Zonda 1:24.453? (1:24.131 11th) . Other than the first three changing positions, and then the next two too, there aren’t any other alterations in the order – but the biggest change is that of the #2 Vitaphone Maserati, from third to first. Jamie Davies set the #2 car’s best actual and best ideal times – and that ideal lap, nominally two tenths quicker than anything else, included a second sector time that was three tenths ‘off’ (traffic).. so he was potentially half a second quicker than anyone else. By then, the FIA GT Bureau will presumably have analysed the figures from Dijon, and worked out which cars will carry what handicaps – so that the cars’ performance will be as similar as possible… so the above is only of interest for interest’s sake. NB. We missed out the #5 Phoenix Aston Martin from the combined times page: it only seems to have run on day 2, and slotted in behind the other Aston Martins.